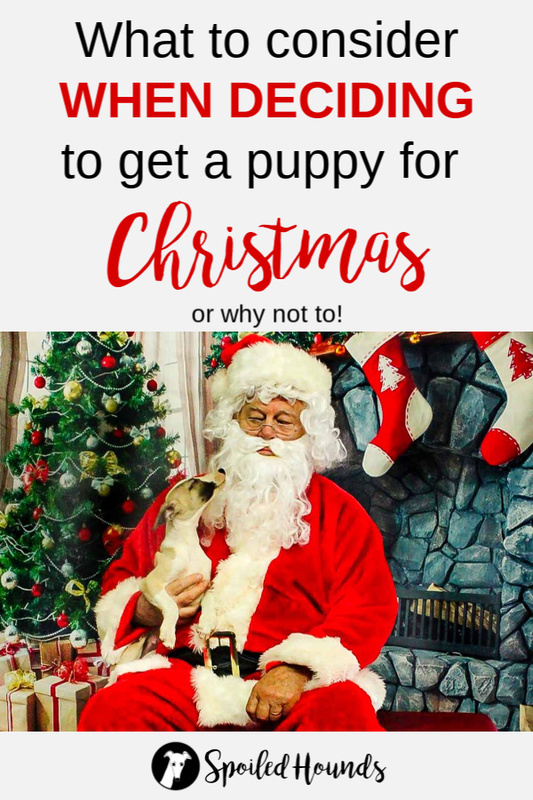 Are you thinking about getting or gifting a puppy for Christmas? In your mind, you have all those delightful images of a magical Christmas morning with a puppy. It’s a heart-warming scene depicted in movies, TV shows, commercials, and books. Is it a good idea in reality? What should you consider in your decision? 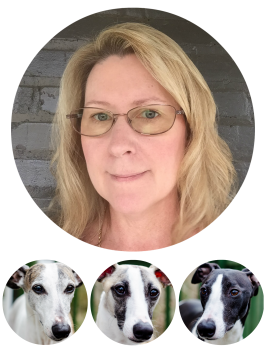 To answer those questions, I’d like to introduce Helen Edwards, author of All About Archie: Bringing Up A Puppy (Affiliate link). She has some great insight on why not to get a puppy for Christmas (or what to expect if you do). I’m happy to share it with you and hope it will help with your decision. 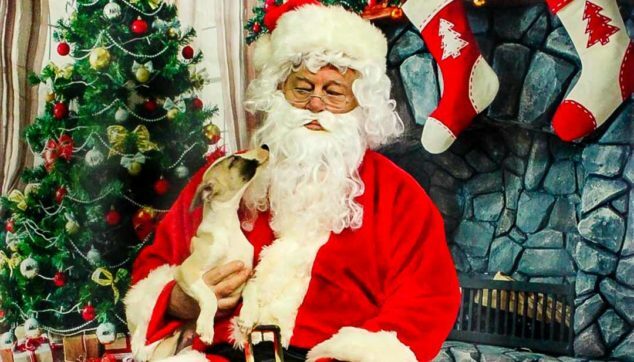 An adorable puppy for Christmas with Santa. Despite dog charities doing their best to educate people that puppies and dogs shouldn’t be given as a surprise Christmas present, each year there are still people who think it’s a great idea. Little thought seems to have gone into what happens after Christmas. Dog rescue centers could quote you unbelievably high statistics as to how many puppies are given to them to be rehomed each January (too many), as well as older dogs abandoned to make way for the new puppy! Unlike unwanted clothes, dogs have feelings. Puppies will begin to get used to their new home and to bond with their family, yet all of a sudden will find themselves in a rescue center not having a clue what’s going on; is that fair? Puppies really shouldn’t be given as a surprise Christmas gift; they need to be planned for. If you’ve never had a puppy before and you’re thinking of getting one around Christmas, have you thought it through? Your routine is likely to be different. Although puppies will need socializing, they do need a bit of time to settle down. If you’re having people round did you know that you’ll need to provide a quiet spot for your puppy to have some time out? Young children will need to be watched so that they don’t pester the puppy too much – puppies need lots of sleep. And if you have plans to go out, are you taking your puppy with you or are you leaving him behind? Does he travel well? Will he be welcome at your friend’s house? He can’t be left on his own for long, so who’s going to stay at home with him? Puppies are adorable and lots of work too! Maybe you tend to have a quiet Christmas, and your routine doesn’t change all that much, so you think you can cope with a puppy. A word of caution; my husband and I got our puppy in late January 2016 and after an overwhelming couple of weeks with our new puppy, we both said we were glad we didn’t get him just before Christmas. If we had, Christmas would have been canceled! So think about it from that perspective too. Christmas is a stressful time of year anyway, and a puppy will only add to those stress levels. They’re gorgeous, there’s no disputing that, but they pee and poo everywhere; they will have you standing out in the cold and damp for hours on end; they will chew everything they can get hold of; bite; want to play when all you want to do is sleep; they may be sick or have diarrhea, and so on. 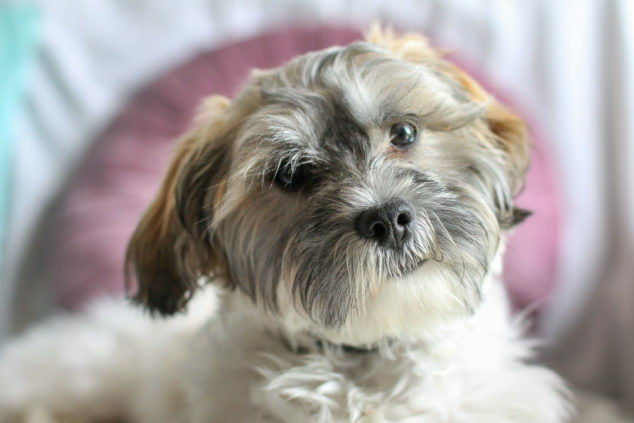 Are you prepared to deal with all of that over Christmas, and not only for Christmas, but for all those weeks until your puppy is toilet-trained when his adult teeth come through, and he learns not to bite? Even an adult dog needs a lot of attention. It’s not like having a hamster – a dog needs exercise and mental stimulation every single day (oh, and lots and lots of love). Do your research; look at all the different breeds. Which breed would suit your lifestyle? Look at the costs involved. If you can, borrow a dog from a friend for the day in order to get a taste of what life with a dog is really like. Know that getting a puppy can trigger anxiety or make you feel depressed. Many people, myself included, have suffered from what I call the puppy blues. The more prepared you are the better, and then no matter what time of year you get your puppy, he won’t end up another statistic. Zephyr finally living happily with his 4th family. Thank you, Helen, for sharing your valuable insight! Getting a puppy for Christmas is truly a big decision and all things need to be considered in the process. I noticed my next door neighbor got a puppy the same year we got Luke. A month later they gave up their puppy. It was heart-breaking to think about that puppy going to a shelter with so many other puppies in the same situation. Oh, and it goes for adult dogs too. Having to go from home to shelter to home and again has to be awful. 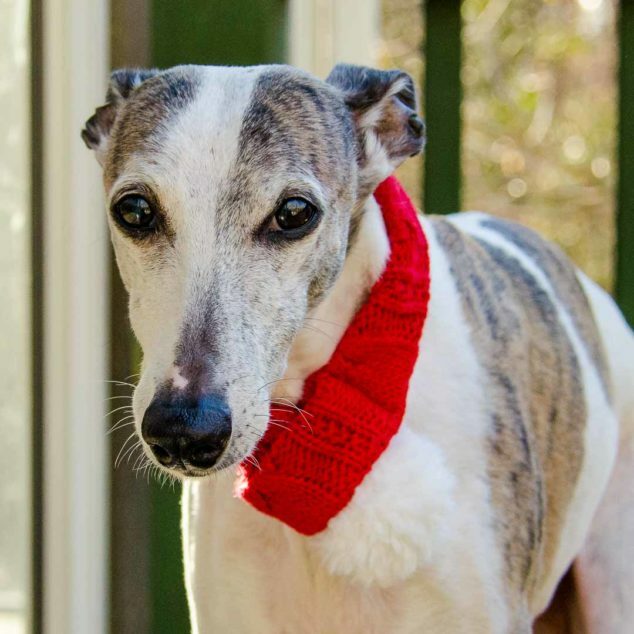 My rescue whippet, Zephyr, lived in 3 previous homes, not counting where he was born. At least now he will live happily in our home for the rest of his life. If you decide to get a puppy for Christmas, I highly recommend getting Helen’s book All About Archie: Bringing Up A Puppy on Amazon (Affiliate link). It has lots of helpful information and tips for new puppy owners.